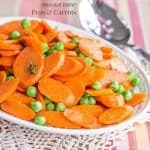 A simple recipe for a springtime side dish or meatless main that is ready in less than thirty minutes. 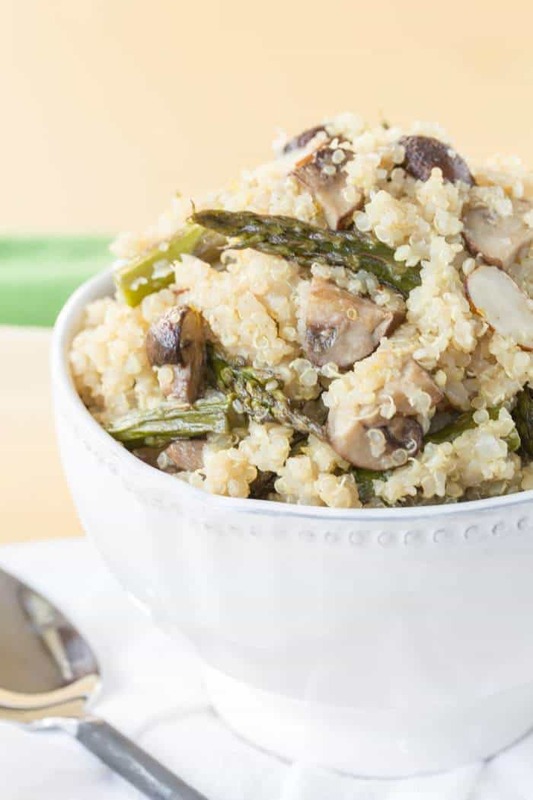 Quinoa pilaf with roasted asparagus and mushrooms is a healthy, satisfying side dish, or meatless main meal. 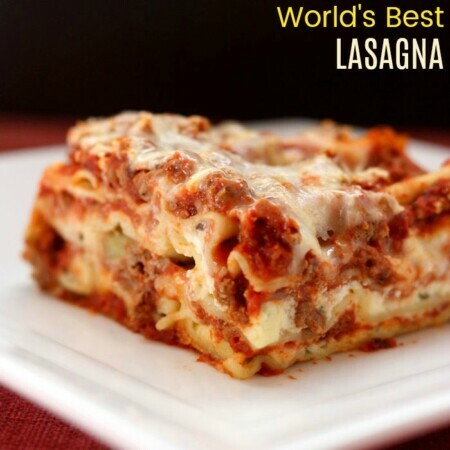 You can make this easy recipe in less than thirty minutes! It celebrates the flavors and ingredients of the season, making it the perfect addition to a springtime holiday menu. 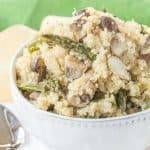 One of my favorite gluten free asparagus recipes (that also happens to be vegan) is this Roasted Asparagus and Mushroom Quinoa Pilaf. You guys, I have a serious problem. Like, no joke, there must be something wrong with me and my body chemistry or something. I need your help!!! You see, I made this absolutely fabulous quinoa pilaf recipe on a Sunday. It has one lousy shallot in it. Not a giant onion. Not five cloves of garlic. One. Little. Shallot. On Tuesday, after I had taken, what, at least two or three showers and washed my hands approximately 632,520,472,603,831 times (I have the dry skin to prove it), my hands still smelled like shallot! I’ve tried the whole rubbing your hands on the stainless steel faucet thing. Obviously, there had been repeated soap usage. Other times I’ve resorted to lemon juice, but given the current condition of my hands, I deemed that entirely too painful to attempt. HELP! Seriously. What are your tips? I think I’m just going to start doing all of my chopping of fragrant ingredients with rubber gloves on. So you’ll notice that most of my recipes aren’t too onion or garlic-heavy. Why? Well not only do my hands seem to absorb those smells, but I also tend to taste those flavors for, like, a week. But sometimes I need just a bit because it tastes so good. Like in this quinoa pilaf! This Roasted Asparagus and Mushroom Quinoa Pilaf is absolutely the dish you want to make this spring. I swear I could have eaten the entire bowl, but the biggest surprise was my three guys. who aren’t the biggest fans of asparagus or mushrooms or quinoa actually enjoyed their servings as well. I was pleasantly surprised! 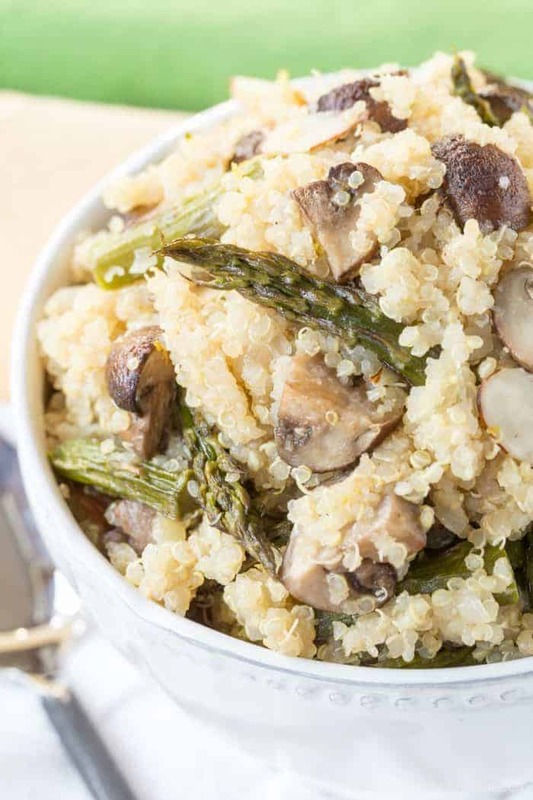 How to make Quinoa Pilaf with Roasted Asparagus and Mushrooms? Roasting the asparagus and mushrooms together intensifies their flavor. Toss them in some olive oil with salt and pepper and pop them in the oven on a sheet pan. While the veggies are working magic in the oven, all you have to do is simply saute some shallots and add a little white wine. Rinse and drain the quinoa and add it to the pan with stock (I used chicken stock, but a vegetable broth or stock would make this totally vegan) and let it cook. Pull the asparagus and mushrooms out of the oven and toss with the quinoa. Finally, add a little lemon zest to freshen it up and some sliced almonds for crunch. 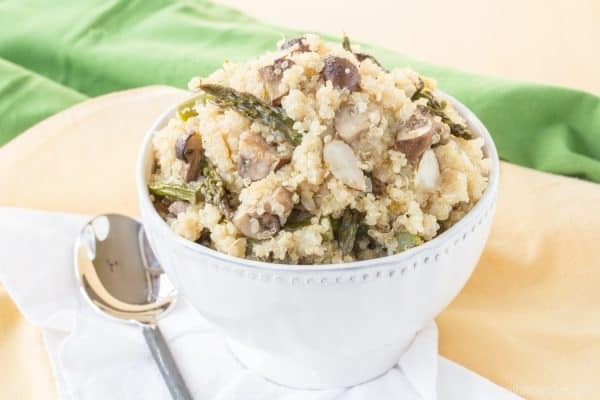 What to serve with Roasted Asparagus and Mushroom Quinoa Pilaf? For a Sunday dinner, enjoy this dish with Lemon Herb Slow Cooker Roast Chicken or Rosemary Balsamic Roast Chicken. 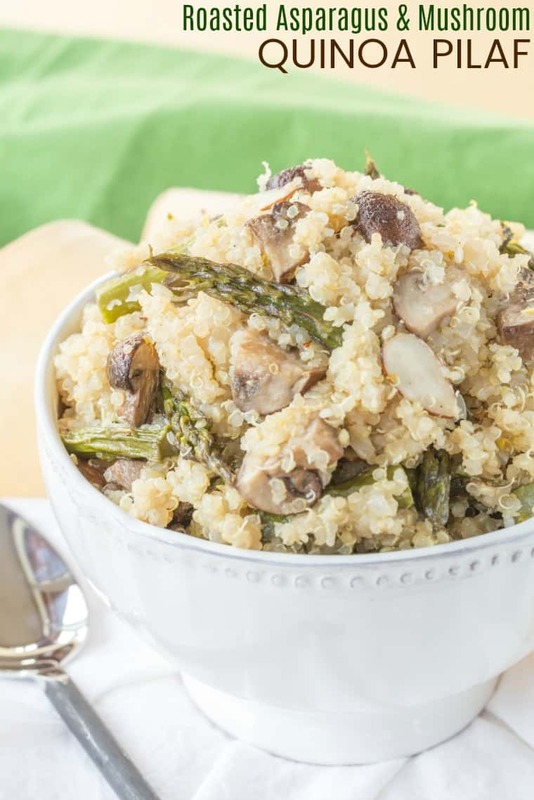 When grilling season arrives, asparagus mushroom quinoa is delicious with grilled pork chops or marinated flank steak. For a seafood option, stir in shrimp or scallops when you add the veggies. Serve it alongside Smoked Salmon Tart for brunch. The spring flavors also make this a lovely side dish for your Easter ham. Quinoa pilaf also makes a satisfying meatless main dish on its own. You can also enjoy it as a light lunch over a salad with a little olive oil and lemon juice, plus a sprinkle of feta cheese. 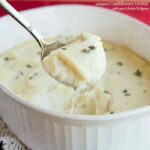 What are other spring vegetable side dish recipes? This delicious quinoa recipe is a simple springtime side dish or meatless main. Filled with roasted vegetables, crunchy almonds, and fresh lemon flavor, everyone will love this versatile recipe. 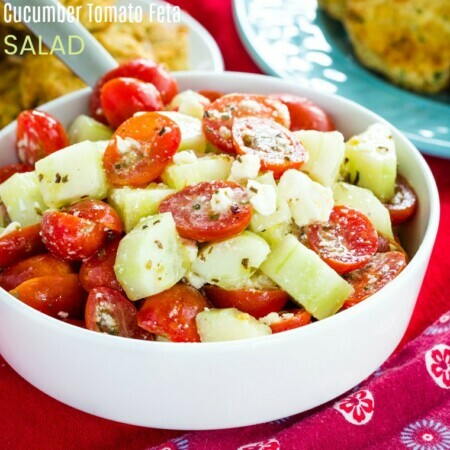 Serve it on its own, over a salad, or sprinkled with feta cheese. Mix in shrimp or chicken or have it with grilled steak or pork. Or even add it to your Easter menu to go with your holiday ham. Toss the asparagus snd mushrooms with 2 Tablespoons olive oil, 1 teaspoon salt, and freshly ground black pepper. Lay in a single layer on a baking sheet, and roast until tender, about 20-25 minutes. While the vegetables are roasting, heat 1 Tablespoon olive oil in a skillet over medium heat. Add shallot and a pinch of salt, and cook until soft, about 3-4 minutes. Add the quinoa and toast for 3-4 minutes. Add the wine, and cook for a couple of minutes to reduce the liquid a bit. Remove from heat and leave covered for 5 minutes. Fluff the quinoa with a fork and stir in asparagus, mushrooms, lemon zest, and almonds. Season with salt and pepper. 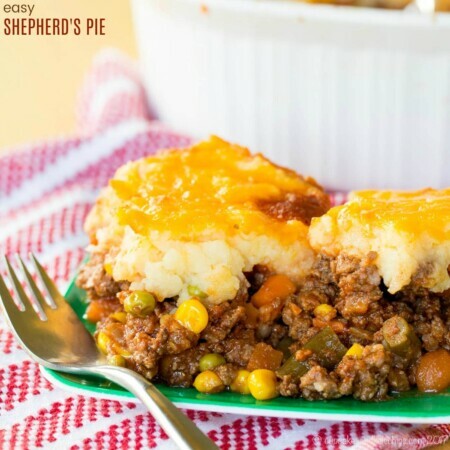 This recipe serves 8 as a side dish or 4-6 as a main course. Nutrition calculated for a side dish. what do you do with the lemon zest? I’m sorry, just stir it in with the asparagus, mushrooms, and almonds. My go to tips is to use latex gloves when chopping especially fragrant ingredients! Ditch the thick rubber ones in favor of latex gloves and for more control and dexterity. We made recipe last night and enjoyed it with pan roasted chicken thighs – delish! Thanks for sharing. Oh wow, so glad you like it! Yes, I do need to keep some latex gloves in the kitchen! 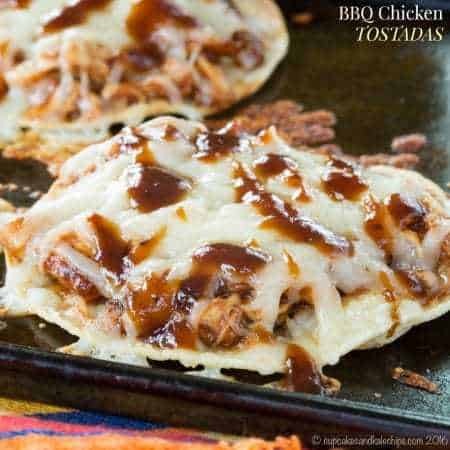 My husband and I are trying to make healthier choices and this recipe looks amazing so we’re adding it to your list! This looks incredible! I love asparagus so I will definitely be making this dish soon. Thanks for sharing at Merry Monday this week! Yum! I might actually LIKE quinoa this way! Yum! I’ve been making more quinoa lately, haven’t tried with asparagus. Need to try! I LOVE quinoa. The hubs not so much. But with the asparagus, I’m sure he’d dive in to this recipe. I love the idea of roasting the asparagus and mushrooms together. I could have eaten them off the pan! Looks delicious! IDK Brianne. Maybe wear gloves? I should, I’m just too lazy to get them out!